At WCJ Worldwide we only use the highest quality fine wire steel rod (C1006) to make your stitching wire. Steel rod is made by a batch melting process in an electro arc furnace. This produces batches of molten steel known as heats. This rod is now ready for the wire mill where it is drawn into wire using state-of-the-art drawing equipment (pictured right). We use a patented anneal heat treating process to attain uniform fine grain structure in your wire. This process assures us that you will have consistent tensile and ductility throughout, from the start of the wire to the end. We use an insoluble electro plating process to insure an ultra-smooth, uniform galvanized coating which enables your wire to slide easily through your machines. Without this technique your wire can produce fine flakes - almost a dust - which can quickly clog up a stitching machine. 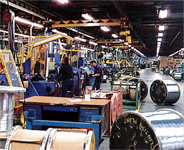 Our technically advanced finishing department produces wire in a wide range of types and styles. 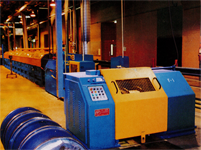 We employ state-of-the art finishing machines to ensure even spooling and weights. 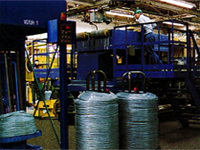 Every batch of wire is checked for: Tensile, Ductility, Camber, Cast, and Circe Diameter to meet set parameters of each individual spool. We carry out 100% inspection of each spool to guarantee the finished wire is to our specifications in regards to wire diameter, weight, and finish quality.